“Market conditions are changing. The continued rise in interest rates suggests we are in the early stages of a bond bear market, which could intensify as central banks withdraw liquidity. The receding tide of liquidity will start to reveal more rocks beyond what has been exposed in emerging markets so far, and the value of a value discipline will be in avoiding the biggest capital-destroying rocks. If a rock emerges on the crowded shore of U.S. momentum, it could result in a major liquidity challenge, as momentum is often most intense on the downside as a crowded trade reverses. So investors are facing a large potential trade-off right now: continue to bet on the current dominance of momentum and the S&P 500, or bet on change and take an active value bet in names with attractive value and optionality, but with negative momentum,” said Clearbridge Investments in its market commentary. We aren’t sure whether long-term interest rates will top 5% and value stocks outperform growth, but we follow hedge fund investor letters to understand where the markets and stocks might be going. This article will lay out and discuss the hedge fund and institutional investor sentiment towards Cognizant Technology Solutions Corp (NASDAQ:CTSH). Hedge fund interest in Cognizant Technology Solutions Corp (NASDAQ:CTSH) shares was flat at the end of last quarter. This is usually a negative indicator. The level and the change in hedge fund popularity aren’t the only variables you need to analyze to decipher hedge funds’ perspectives. A stock may witness a boost in popularity but it may still be less popular than similarly priced stocks. That’s why at the end of this article we will examine companies such as Mizuho Financial Group Inc. (NYSE:MFG), The Southern Company (NYSE:SO), and Brookfield Asset Management Inc. (NYSE:BAM) to gather more data points. To most investors, hedge funds are seen as unimportant, outdated investment vehicles of yesteryear. While there are over 8,000 funds with their doors open at the moment, Our researchers hone in on the masters of this club, about 700 funds. Most estimates calculate that this group of people watch over most of the smart money’s total asset base, and by keeping an eye on their top stock picks, Insider Monkey has revealed a few investment strategies that have historically outperformed the S&P 500 index. Insider Monkey’s flagship hedge fund strategy outrun the S&P 500 index by 6 percentage points annually since its inception in May 2014 through early November 2018. We were able to generate large returns even by identifying short candidates. Our portfolio of short stocks lost 24% since February 2017 (through December 3rd) even though the market was up nearly 23% during the same period. We just shared a list of 11 short targets in our latest quarterly update. Let’s take a look at the latest hedge fund action regarding Cognizant Technology Solutions Corp (NASDAQ:CTSH). How are hedge funds trading Cognizant Technology Solutions Corp (NASDAQ:CTSH)? Heading into the fourth quarter of 2018, a total of 42 of the hedge funds tracked by Insider Monkey held long positions in this stock, no change from one quarter earlier. 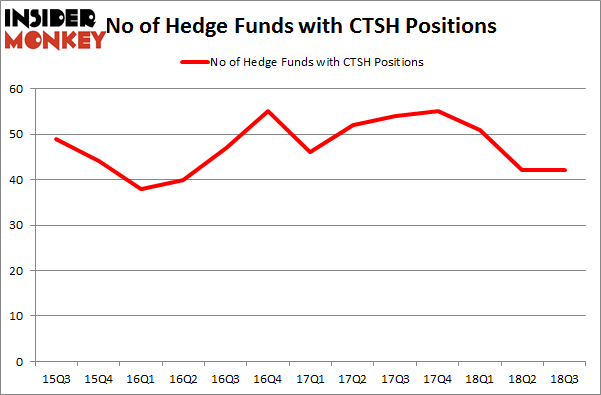 By comparison, 55 hedge funds held shares or bullish call options in CTSH heading into this year. So, let’s see which hedge funds were among the top holders of the stock and which hedge funds were making big moves. According to publicly available hedge fund and institutional investor holdings data compiled by Insider Monkey, Richard S. Pzena’s Pzena Investment Management has the largest position in Cognizant Technology Solutions Corp (NASDAQ:CTSH), worth close to $521.3 million, amounting to 2.5% of its total 13F portfolio. 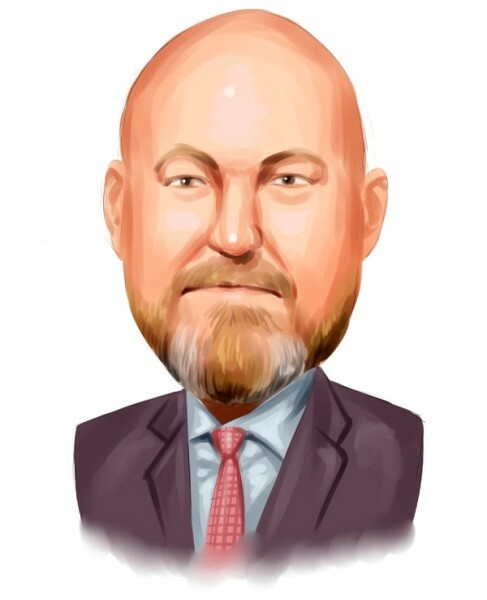 On Pzena Investment Management’s heels is Cliff Asness of AQR Capital Management, with a $314.6 million position; 0.3% of its 13F portfolio is allocated to the company. Remaining hedge funds and institutional investors that hold long positions include Peter Rathjens, Bruce Clarke and John Campbell’s Arrowstreet Capital, Noam Gottesman’s GLG Partners and PVH’s Yacktman Asset Management. Due to the fact that Cognizant Technology Solutions Corp (NASDAQ:CTSH) has faced falling interest from hedge fund managers, it’s easy to see that there was a specific group of hedge funds that slashed their positions entirely last quarter. At the top of the heap, Gil Simon’s SoMa Equity Partners said goodbye to the biggest stake of the 700 funds followed by Insider Monkey, comprising about $19.7 million in stock, and Dmitry Balyasny’s Balyasny Asset Management was right behind this move, as the fund cut about $9.4 million worth. These moves are intriguing to say the least, as total hedge fund interest stayed the same (this is a bearish signal in our experience). Let’s now take a look at hedge fund activity in other stocks similar to Cognizant Technology Solutions Corp (NASDAQ:CTSH). We will take a look at Mizuho Financial Group Inc. (NYSE:MFG), The Southern Company (NYSE:SO), Brookfield Asset Management Inc. (NYSE:BAM), and Zoetis Inc (NYSE:ZTS). This group of stocks’ market valuations match CTSH’s market valuation. As you can see these stocks had an average of 22.25 hedge funds with bullish positions and the average amount invested in these stocks was $965 million. That figure was $2.03 billion in CTSH’s case. Zoetis Inc (NYSE:ZTS) is the most popular stock in this table. On the other hand Mizuho Financial Group Inc. (NYSE:MFG) is the least popular one with only 3 bullish hedge fund positions. Compared to these stocks Cognizant Technology Solutions Corp (NASDAQ:CTSH) is more popular among hedge funds. Considering that hedge funds are fond of this stock in relation to its market cap peers, it may be a good idea to analyze it in detail and potentially include it in your portfolio.